No Pun Intended, but it was INCREDIBLE, the lighting and story again Pixar kills it ! Probably a 3 but had to give a 4 rating because of Jack Jack. The kids in this were so bratty. I loved that the kids in Mary Poppins Returns were so polite and helpful, but I guess that's a bygone era when parents were actually hands on and taught their kids manners. Our 3 year old grandson is obsessed with this movie. He ask to go to the movies every week to see it again. The Only Good Parts were with JACK JACK ! The Flashing in the movie was a Dumb Move Disney !!!!!! 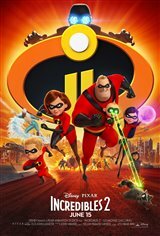 This film was a great tribute to the original “Incredibles”. There were several reoccurring characters which really tied the whole film together, some might argue that because there were so many characters some characters were under used; including the beloved “Frozone”, I would have loved to see more of him in the film. Other than that, there was a wonderful balance between comedy and action in this film and I definitely recommend that you watch it. Fun family movie. Love the action. I thought the First one was a little better but still some funny parts and loved the Funny lady. Only problem was the Intense Strobe lights for this Animated film that Disney could have done with out that I was warned about. It's not for everyone there were 2 to 3 sequences of 2 minute full screen strobe lights. The Cinema did have a warning about this but I thought it was one very short Sequence but I was wrong. This was a great movie with lots of exciting scenes. The kids loved it and so did I!! Good fun movie. A little slow as they built the plot, but got moving once they had that done. Total disaster. Don’t watch it. First one was way better then this. This was boring and garbage at the same time. Don’t waste your time and money. Good family movie. Watched in 3D with granddaughter and enjoyed it. Very funny movie. Nothing dark in the movie. Scary? Naaaa. I absolutely loved this movie. I think that the characters were hilarious, especially the baby Jack Jack. It was humorous, mysterious, and had a bunch of wowing moments. I suggest you to watch this movie with the whole family. I didn't want to see this movie my granddaughter did. I'm glad I did, I enjoyed it. The baby character in the movie was the best. I watched this movie two times. My heart is yours, Edna. Should have been called The Incredible Elasticagirl; the rest of the family (including the dad) did very little hero stuff. Frozone did more than the other 4 family members. I enjoy strong female lead movies, but this was over the top. Based on the trailer alone, not worth buying a ticket for. I don’t like his attitude regarding adoption of children. Great kids movie, no blood mess or death. Good for parents who don't want their children exposed to that sort of stuff. A fun kids movie but also a movie for adults. We had a good time watching this movie. I loved the Racoon part with the baby. Watching this movie was the right choice to had a good time. This what some movies are about it. I think this was a funny movie. I watched this movie without thinking about all the drama some people make with the characters. I found very silly the previous post. Lol. Do NOT watch in theatre, another Disney politically correct betrayal. Rent it when it comes out, then buy it if you still wish. 12 of us went to see the movie with our kids, so far none of our ratings have remained up. The first movie was so popular because it hit the anti-PC nerve, 'everyone special means no-one is'. Fans fed up with feminist social just warrior movies, remakes ANYTHING against men, traditional families, romance. As two of the original producers complained, the reason the obvious sequel blocked decades through 7 Shreks, because Disney demanded the story turn into feminist superiority again. It's NOT the movie we all found sanctuary in for dad, mom and kids. It's another politically correct betrayal. All our posts have been removed, we'll try all at the same time this time and hope someone notices. Sorry I took my son to see this film. I had really pumped it up to him as the first one was so good. Was not impressed with adding swearing (hell and damned) to a movie aimed at children. Also, the characters saying "Oh my God!!" as opposed to 'Gosh' was also surprising. I know this isn't a big deal to most people, but using this phrase in our house is not allowed. And of course my son picked up on this right away and had a bit of a sense of embarrassment and confusion about it, knowing this is something that is taboo for our family. I also found myself uncomfortable trying to explain to him why in a children's movie these 'adult words' and use of the word God in such a way was even necessary. An excellent family film that everyone can enjoy. The plot moves along at a good pace and it is easy to follow. However if you haven't watched the first film you may be a little lost with the incentives of some of the characters. The action and comedic scenes are very good but there are a few moments where there are strobe lights used throughout the film. It can be pretty difficult to watch at times in a theater and those who have epilepsy should steer clear. Enjoyable movie. No swearing. I loved it. is is new, fresh and a very exciting sequel to the movie. i will definitely buy this as soon as it comes out. I am glad to see that the focus was about the mom this time! It was also great to see the stay at home dad for once & allowing him to figure things out for once! The kids stepping up to save their parents & friend was nice to see also! Family & friends coming together to work as a team to accomplish something & not having the same main hero was one way of saying that the hero sometimes isn't always the biggest but the team that works together! GREAT JOB! BTW-our kids loved it! !